Ever heard of something called “The Draco”? The Draco is one of the worst arcs of Austen’s already fairly shaky 2 run; and generally considered to be one of the worst X-Men stories ever. It’s the continuity equivalent of awkward makeouts at your company Christmas party: everyone does their best to politely pretend that it never happened, and if anyone brings it up, everyone familiar with the story gets acutely embarrassed by proxy. I am telling you about The Draco not because it has any relevance whatsoever to X-Men: Evolution–it doesn’t–but so that you will understand where the bar sits when I tell you that “Shadowed Past” is my least favorite take on Nightcrawler’s origin story. I can summarize most episodes of X-Men: Evolution from memory, in a fair degree of detail; so it surprised me when, in reviewing the Season 1 roster, I realized I recalled almost nothing of “Survival of the Fittest” beyond the fact that it involved some kind of summer camp scenario. When I started to watch, I realized why: in a season where even the bad episodes are usually entertaining, this one is just boring as all hell. On my first pass, I stopped taking notes five minutes in, because nothing was happening. By the halfway mark, I was actively fantasizing about watching paint dry.1 But I am nothing if not committed, readers. I promised you a recap, and a recap you would have, come hell or high water. Ah, well. At least I get to judge cartoon teenagers for their fashion choices. I mentioned in the recap that S1E8 of X-Men: Evolution is all about gratuitous Sabretooth close-ups, but just in case I failed to convey their full grandeur, here is a gallery of ten, each from a different shot. Yes, seriously. Here’s the thing about Spyke: he’s a character born of good intentions and just stunningly thin execution. He’s got a lot of potential, but the actual episodes that focus on him–which are fairly few and far between–and his eventual, deeply dubious fate are almost universally weak. I want to like this dude, and sometimes I really do–but often, it’s in spite of, not because of, the stories built around him. Ah, well. We’ll always have Dracula: The Rock Musical. AND WE’RE BACK! Hi, Evolution! I’ve missed you! Not only am I back recapping X-Men: Evolution, but I get to jump back in with my hands-down favorite episode of Season 1. Remember back in Episode 3, when I told you that a lot of the best stuff in Season 1 revolves around Rogue? This is what I’m talking about, right here. “Turn of the Rogue” is a great showcase of my favorite aspects of X-Men: Evolution: the balance and interaction of the superheroic and the personal; emotionally resonant coming-of-age stories; and some of the strongest writing and performances of the season. Also, Mystique turns into an eagle. I like this episode, because this is where Evolution starts to catch its stride and find its voice. “Middleverse” is kind of a mess animation-wise, but it’s also a one-off, a lighthearted breath of fresh air before we dive headfirst into the Big Ongoing Story next episode. It also gets bonus points for being a Forge episode, which is almost always a plus. Comics Forge tends to be dark and brooding and at the center of convoluted storylines and soap opera, but two out of three animated Forges are uncomplicatedly delightful. The best animated Forge, of course, is Wolverine and the X-Men Forge, who just straight-up is Miles to the extent that we had his action figure in college and more than one person assumed it was a custom portrait. But Evolution Forge is pretty great, too. But while “The Cauldron” is terrible, it’s hilariously terrible. “Mutant Crush” is. Well. It’s a decently written episode, I guess. And it’s got a lot of moments I dig. It’s just also really fucked up and disturbing, and not in hilarious and pedantic ways. Right. So. 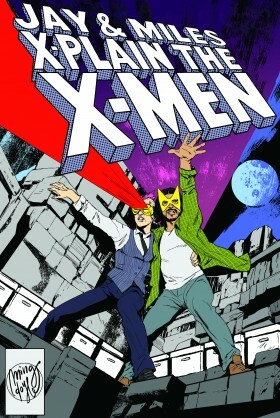 LET’S TALK ABOUT SOME X-MEN! Oh, hell, yeah! It’s Rogue time, y’all! Evolution Rogue is awesome. She’s one of the characters who fares best in reimagining–as I wrote about Cyclops in S1E1, Rogue is very recognizably written in the spirit of some of the best previous versions of the character, with the letter flexible enough to let her develop organically in her new context and setting. So it should be no surprise when I tell you that a lot of the best stuff in the generally pretty shaky and uneven Season One centers around Rogue. And that, my friends, begins here. Lace up your best New Rocks, dig up some black lipstick (or steal your friend’s eyeliner crayon and be careful not to lick your lips), and get ready to rumble. 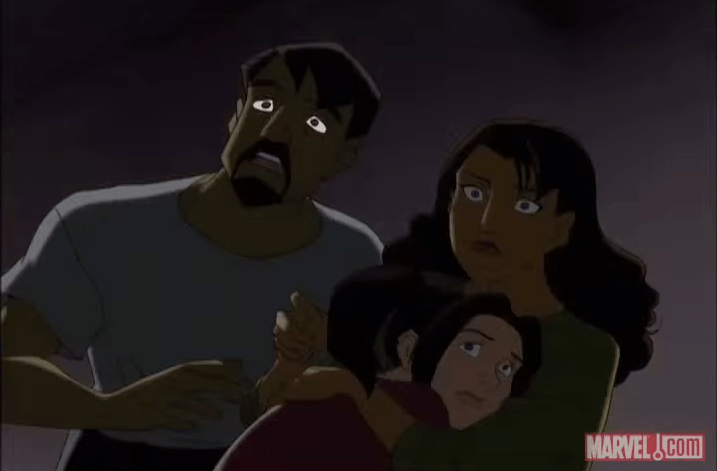 You know how I said that X-Men: Evolution is really entertaining even when it’s really, really bad? This week, we’re gonna put that to the test. Prepare for more rock puns than you have ever heard in a single 22-minute stretch. Also, Transformers. Kinda. In other news, I still have no idea what the titles refer to. BUT FIRST, A PRETEND HORROR MOVIE! We open with the Pryde home, in a fictional town in Illinois. The town has a name, but I don’t care what it is, and it’s never going to be relevant again, so I’m just gonna call it Fake Deerfield. Cool? Cool. OH, MY GOD, IT’S GRATUITOUS LIGHTNING! Kitty dreams that she’s falling, and–spoiler–she actually falls through her bed and floor and lands in the basement. She wakes up screaming, and her parents rush down to comfort her. They think she was sleepwalking–until they look up and a PORTENTOUS FLASH OF LIGHTNING illuminates her blanket, embedded in the basement ceiling. OH MY GOD! THAT’S–actually, wait, that’s not scary at all. Okay, look, I get what they were shooting for here, but you know who has the least horror-movie powers of just about all the X-Men? Hint: It’s definitely Kitty, barring the stories where phased becomes her default state (which this isn’t). Framing this scene and the Prydes’ cheerfully generic suburban house like a horror movie reminds me of one of those recut trailers where you try to make a movie look like a genre it obviously isn’t; or a kid telling a shaggy-dog joke and then waiting for you to be overjoyed at the lack of punchline; or the entire movie White Noise.1 It’s all buildup, with no proportionate payoff. Ew, Cerebro, no. Don’t do that. Meanwhile, back at Stately Xavier Manor, Kitty’s late-night spill pings Cerebro. 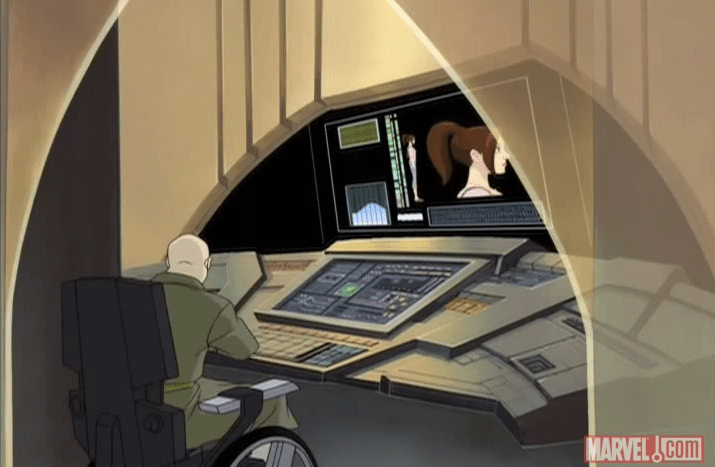 Does anyone else find it unsettling that Professor X has a psychic supercomputer that provides him with turnaround full body scans of teenagers? “What am I?” wails Kitty. “What’s happening to me?” Just give it five seconds, kid–the credits montage identifies you quite clearly as Shadowcat.